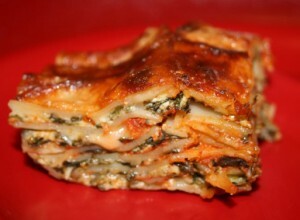 Spinach Lasagna - Kosher In The Kitch! Spinach Lasagna - Kosher In The Kitch! This is your basic Lasagna recipe with two updated tweaks that include a subtle addition of veggies and a new and improved way of cooking with pasta! 1. I use Spinach. It goes well with the cheeses and is a great way to get your daily vegetable without sacrificing flavor! 2. I use oven ready Lasagna noodles. (you can use the pasta that needs to be boiled first, if you prefer) I like removing the task of boiling the water and having to handle the sticky wet noodles, so this works out well for me! Heat up the spinach, then mix it with the ricotta cheese and add an egg. I pour some sauce on the bottom of the pan so the pasta doesn’t stick to it. Layer the lasagna with sauce, spinach mixture and then the mozzarella. I add on Parmesan cheese with the final layer, on top of the mozzarella. Bake for about 45 minutes on 350. To save time, I defrost the spinach the night before (or in the microwave) and I just layer one on top of another so as to not make another bowl dirty and to save time. I also have added italian spices and garlic to my lasagna, but that is a matter of taste. Enjoy!